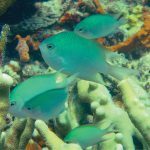 There are numerous examples of scientifically undescribed reef fishes (e.g. the Whitemargin Anemonefish… the Magma Wrasse… the Japanese Velvet Angelfish), but arguably the most attractive of the lot is a colorful dwarf anthias found in Micronesia. While taxonomists have yet to put a name on it, this beautiful basslet is well-known to divers in the region, having been photographed (albeit, quite rarely) for many years now, and it has been informally dubbed the Cave Anthias. The map shown here illustrates every confirmed and alleged record that I can find evidence of, and it suggests a distribution for this species that is confined primarily to the oceanic islands of Micronesia. Divers have typically encountered this species in depths below 40 meters, and, no doubt, it can be expected quite a bit further down into the mesophotic zone. This puts it in the same ecological niche with several other dwarf anthias, such as Randall’s Anthias (Pseudanthias randalli) and the Yellowtail Anthias (P. flavicauda), all of which are likely to be closely related. Uploaded by SPAD Fiji on 2013-07-02. These fishes share a similar morphology and coloration. 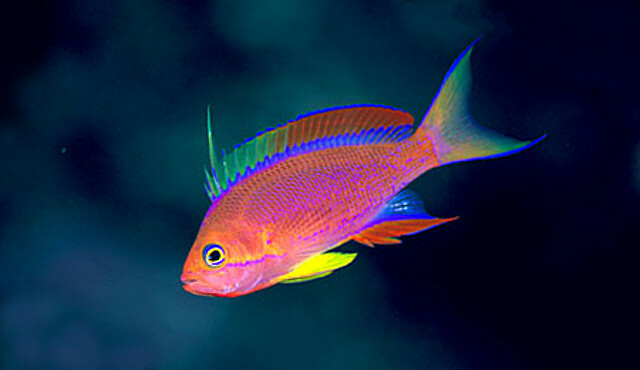 All grow to a maximum size of only around 6-7cm, putting them in the same size class as some of the other pipsqueaks of the genus, like the Ventralis Anthias (P. ventralis) and the Sunset Anthias (P. parvirostris), neither of which appear to be of any close relation here. The relatively low number of lateral line scales (<40) is also noteworthy, as are the unusually vibrant colors of the pelvic fins and the rather angular profile of the head. 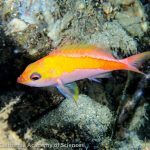 At first glance, it would be easy to mistake the Cave Anthias for a Randall’s Anthias, as both feature remarkably similar colors and patterns along the body; however, a closer look reveals some obvious, if subtle, differences. Most noteworthy are the bright yellow pelvic fins, which are either solidly red or a two-toned red and orange in P. randalli. 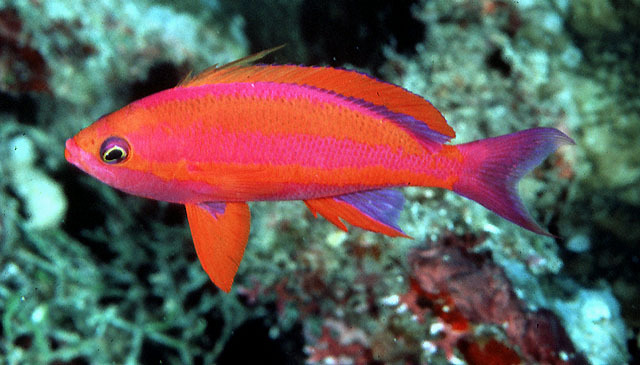 Also of note is the configuration of the stripes, as the Cave Anthias has these broadly joined behind the head, while Randall’s Anthias has these more separated, allowing the medial purple band to reach nearer the eye. 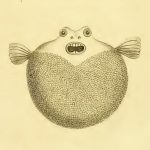 Both of these features are also found in P. flavicauda—a fish known only from the South Pacific— as well as an apparently undescribed relative which has been collected from Kiritimati for the aquarium trade. This latter fish is particularly similar to the Cave Anthias, seeming to differ only in having a yellow (versus partially red) dorsal fin. 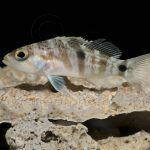 Obviously, there is a strong need to get both of these species scientifically described, as this lingering taxonomic limbo fundamentally inhibits our ability to understand these spectacular fishes. 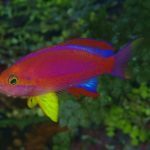 With its small size and beautiful appearance, the Cave Anthias would be an incredible species for a reef aquarium, but, likely, the only way it will ever become widely available is through captive breeding. To date, I can find no record of it having ever been kept in captivity. 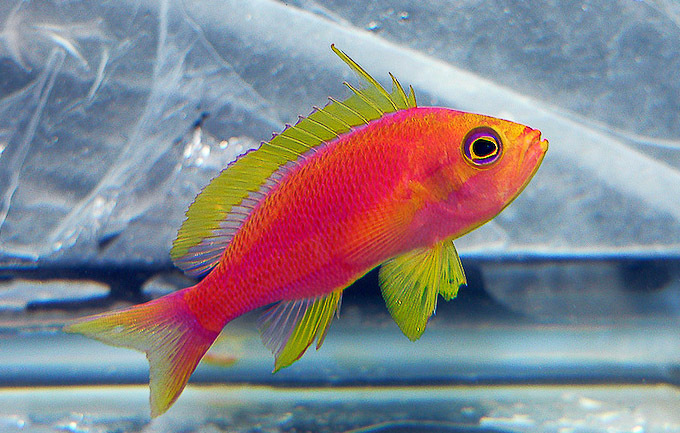 Pseudanthias tequila, The Cave Anthias Finally Has A Name!